The Shonan Hiratsuka Tanabata Festival (湘南平塚七夕祭り) in Hiratsuka celebrates Tanabata or the star festival. It is held in the summer every year on July 7th which is the seventh day of the seventh lunar month of the old lunisolar calendar. It lasts for four days ending with a large parade on the 10th . There are many food stands. Better to visit there by train. The Shonan Hiratsuka Tanabata matsuri in Hiratsuka celebrates Tanabata or the star festival. It is held in the summer every year on July 7th which is the seventh day of the seventh lunar month of the old lunisolar calendar. It lasts for four days ending with a large parade on the 10th . The Tanabata matsuri in Hiratsuka is an especially large-scale event with around 2,000,000 people in attendance each year from all over Japan and abroad during the four days of the matsuri. The matsuri fills the main streets of the downtown, north and west of Hiratsuka station, filling 3 major streets and 6 minor streets that are closed for the duration of the matsuri. The main attraction of the matsuri are 3 metre long bamboo poles which are decorated with beautiful Tanabata ornaments and coloured decorations. These line all the streets around the main shopping district of Hiratsuka. At night these decorations are lit up and give the area a romantic feeling. Around 2,000 food stalls line the streets and many of the shops along the streets have sales on during the matsuri. On the night of Tanabata (July 7th), there is a custom of writing wishes on strips of paper with 5 colours. These can be seen all along the street in between the decorations. During the matsuri there are special performances such as a Kiyari matoi (firemen's parade) and a Sennin Odori in which 1,000 dancers perform traditional Japanese dance. There are performances from local schools showing modern hip-hop and ballet, brass bands, and baton twirling girls. To cap it all off there is the annual Miss Orihime Tanabata beauty pageant. 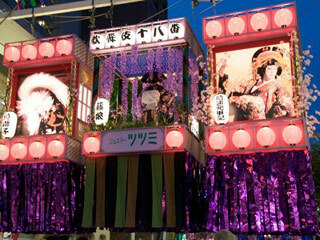 One can rent the three metre long bamboo poles to hang decorations from, the fee is 100,000 yen. Prizes are awarded that can help defray this expense. People begin working on the Tanabata decorations months in advance. Some of the decorations are sponsored by local businesses. Many of the 3,000 decorations are also animated with moving figurines or statues depicting famous scenes from Japanese history as well as local tales. Prizes are awarded separately for daytime and nigh-time displays. Some decorations remain the same each year with traditional tales from the Shonan area or decorations to support the local Bellmare soccer team.